I couldn't host a holiday fashion series without styling a look featuring a little (or a lot) of, you guessed it, sparkles. Nailing holiday sequins with elegance is not as challenging as it may seem. 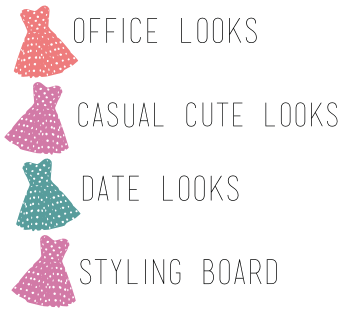 The key to looking refined as opposed to tacky lies in your choice of apparel and complimenting accessories. My tips will help you take your favorite festive, sparkling pieces to the next level of glam. 'Tis the season to twinkle, sparkle, and shine. 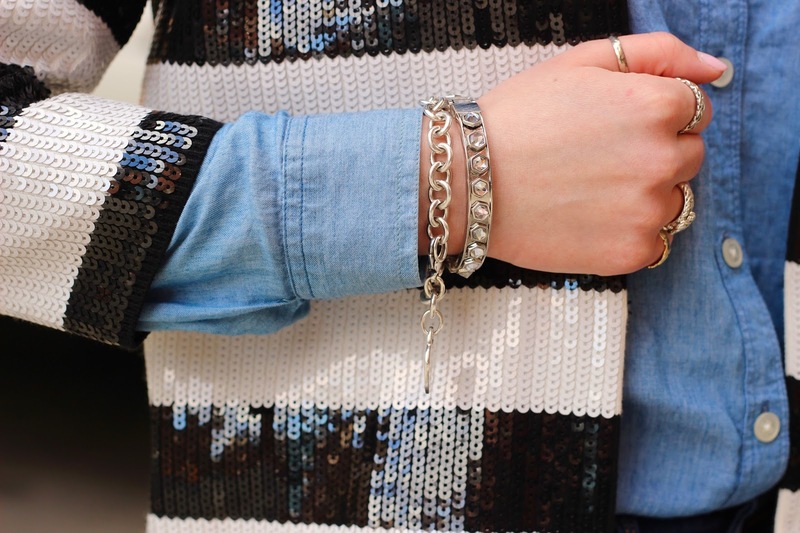 With the help of a sequin jacket you can do all three and be the most stylish in the room. 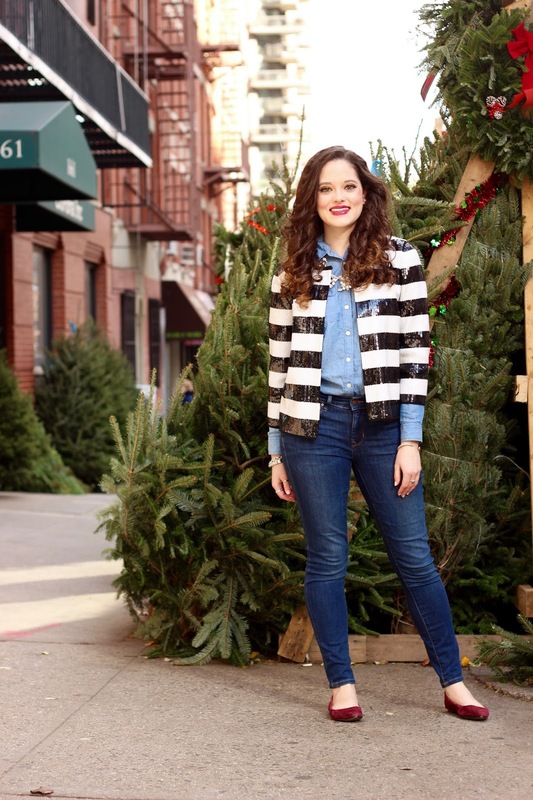 Glitter blazers like the one I'm wearing here were made for this magical time of year. The best way to pull one off? Keep the rest of your outfit simple and within the same color family. Let the statement topper be the star of your ensemble. Don't forget that sequins can be tasteful, just stick to refined shapes and subdued shades. And what you pair these sparkles with matters too. A neutral chambray blouse like this one offsets the glitz with a relaxed, casual vibe, making it an ideal complimentary piece. 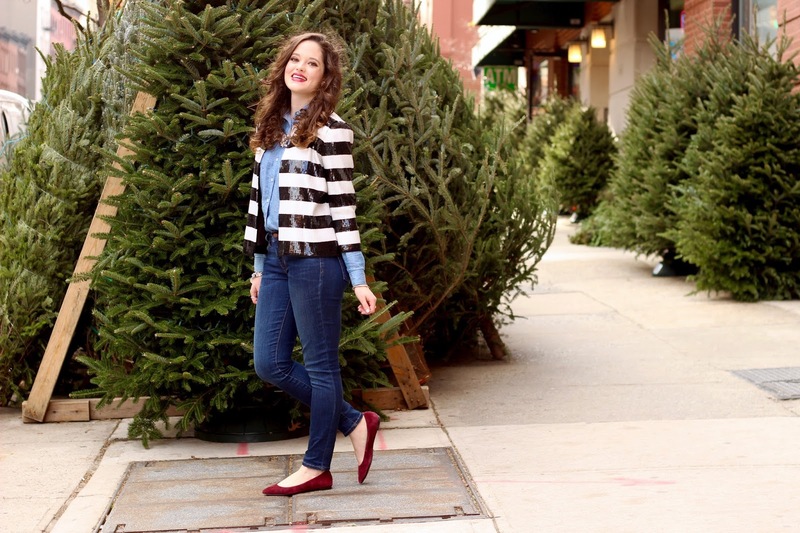 My second Holiday Denim post features another pair of dark wash skinnies, although this pair is lighter than my last. These are more of my "everyday" jeans, which is why I wanted to try dressing them up for a holiday soiree. I love their stretchy feel and they're the perfect wash for just about any look. These burgundy beauties add bold color and rich texture to my ensemble. Burgundy is the color of the moment and I can't help but notice how easy it is to incorporate into my looks - especially during the holidays. 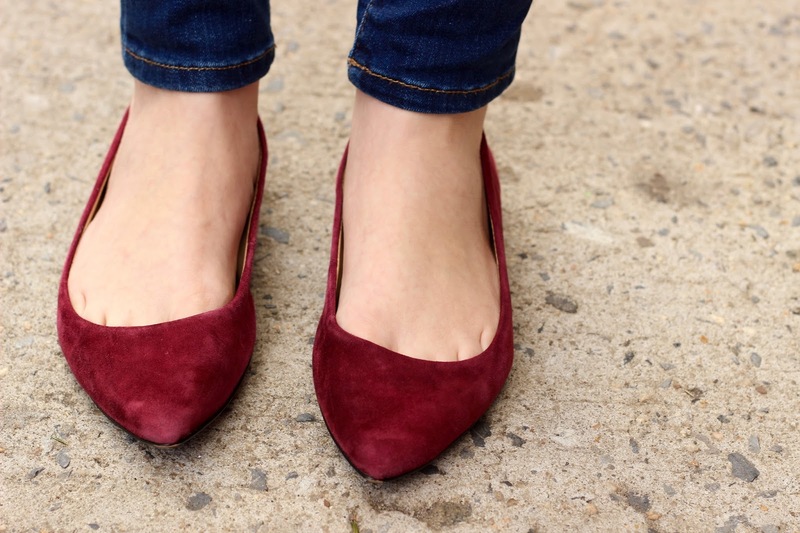 I'm not always a flats girl, but with a polished pointed toe, this pair is a sophisticated option. 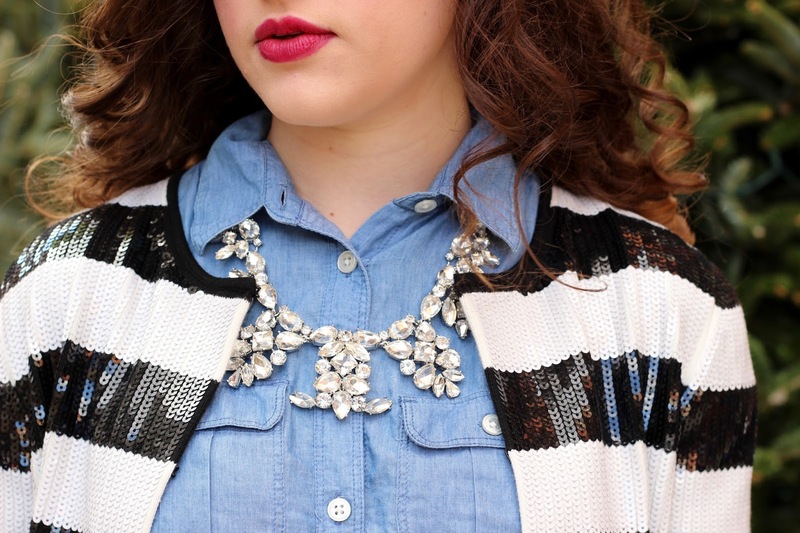 This stunning statement necklace is the icing on the cake for my look - as any good statement necklace is. During party season, the bigger the better. I love this necklace because it's dramatic yet not overwhelming. It's a great way to complete a plain outfit or to add something extra to an already special look. I went bold with my earrings but in a different way from my necklace. 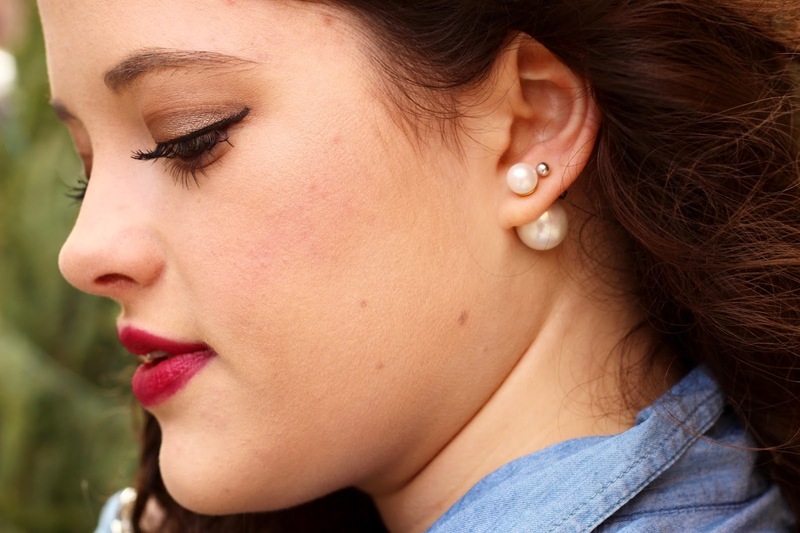 I didn't want my jewelry to compete so instead of opting for sparkles, I chose a pearl-back stud; impactful yet elegant. 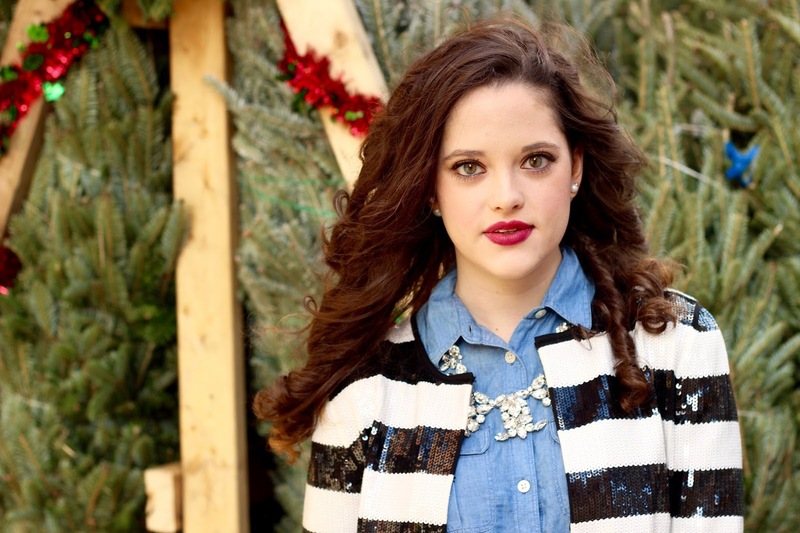 This sequin jacket is a favorite of mine yet every time I pull it out I always say I never wear it enough. It can be hard to style such an attention-grabbing statement piece for regular wear, but during the holidays this jacket fits right in! There's truly no better time to finally shake the cobwebs off your barely-used party pieces. These photos were taken just a block away from my apartment at a Christmas tree stand. For those of you who don't know, New York City is crawling with them this time of year and it's pretty magical! It's my first time celebrating Christmas here and I was delighted to see them spring up after Halloween. My roommate grabbed a mini one for our apartment and we decorated it this weekend with lights and ornaments. 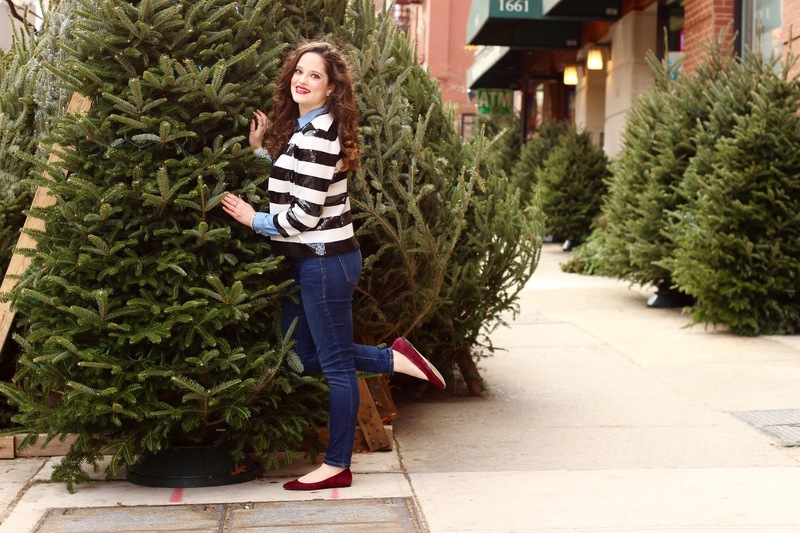 Picking out a live tree is one of my favorite Christmas traditions. It has to be a real tree though because nothing beats the fresh scent of pine for the holidays! Lovely blazer! I love the whole look! I'm in love with this jacket. What a classy way to wear glitter! 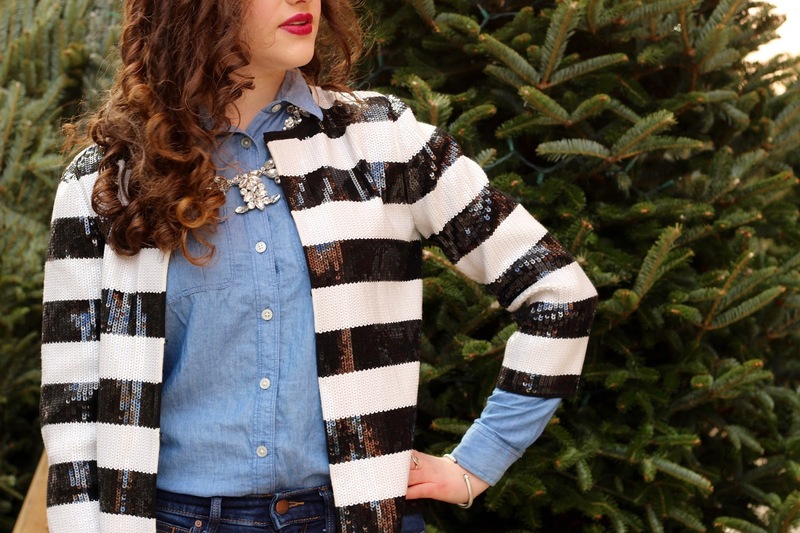 Sequins and stripes?! OMG! That jacket is amazing! What a fabulous jacket!! I like how you styled it casually with the chambray. Can't wait to see other ways you style it! Gorgeous! That jacket is absolutely beautiful! u look so sweet and your hair look so good! Denim on denim is one of my favorite combos! I love how you broke it up with a festive jacket! charming look! so pretty and effortless! This is such a pretty look for the holidays. That blazer is perfect! Great outfit, always you are rocking. I loved this very much. Your color sense is too good. 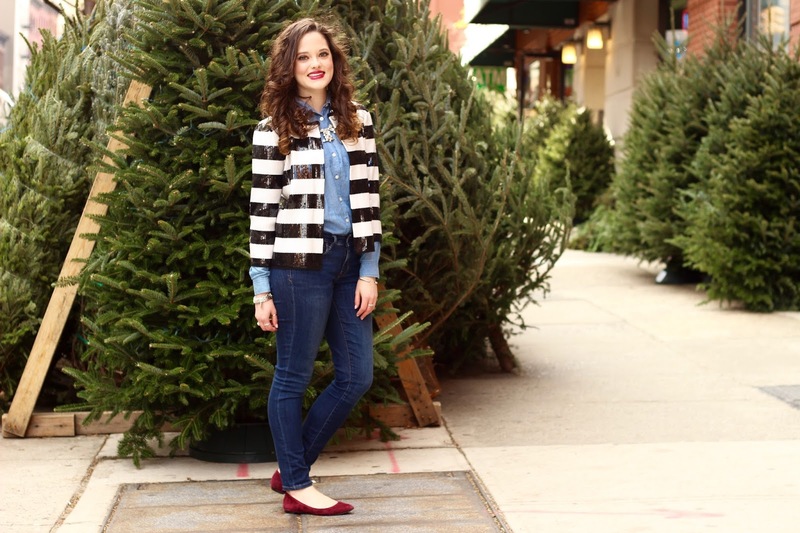 I love layering with chambray and adding the sequined blazer was an added bonus. Gorgeous glam look Kathleen. Oh I am loving the high low dressy casual look here, very nice! And love the Christmas tree background.